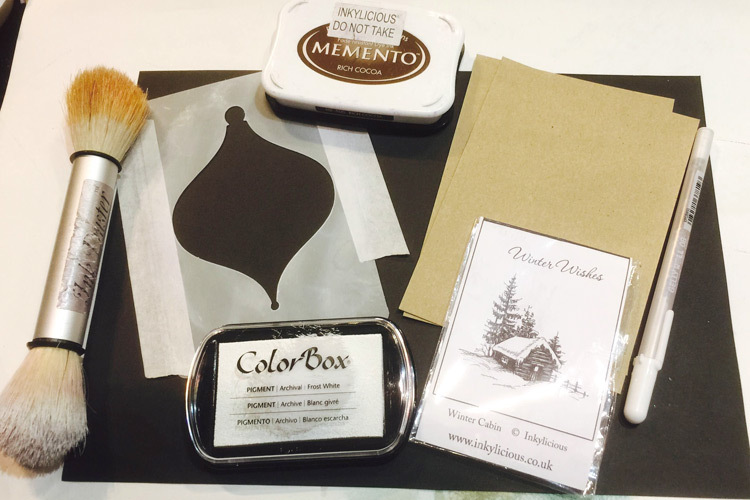 UK designers & manufacturers of Photo-polymer stamps, Stencils, MDF and accessories for Arts & Crafts. Designers and manufacturers of Ink Duster blending brushes. A quick walk through on creating the parchment effect. Whether you have purchased one of our 'Winter Bauble Kits' or the goodies separately here's how to create them. 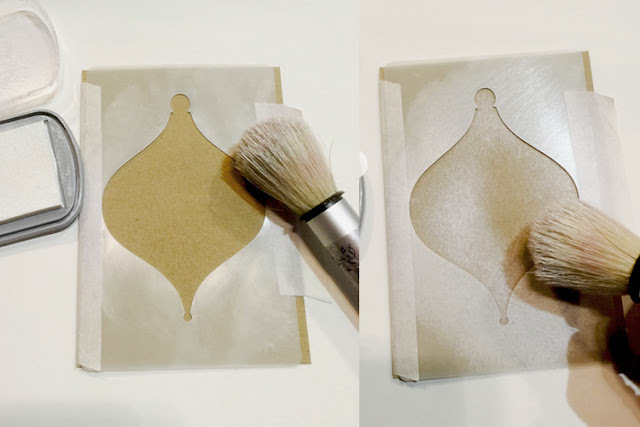 Using Low Tack Tape, tape the stencil on to the Stamping Kraft Card, Hint: I wrap the tape under one side as a hinge so I can lift the other side and check the depth of colour. 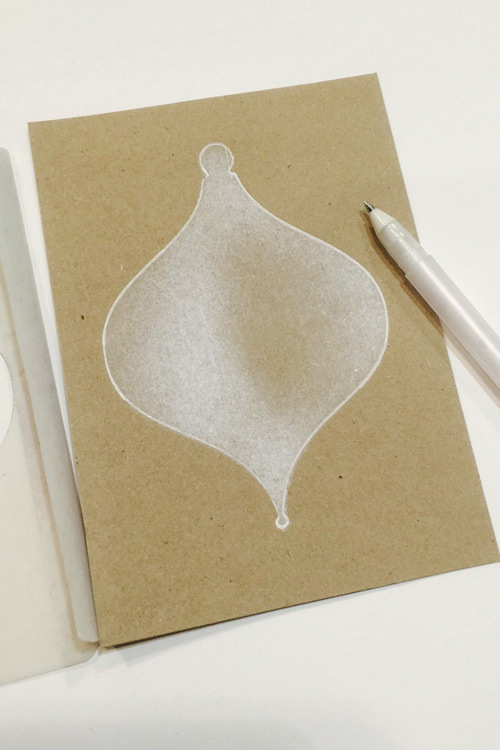 Apply the ink around the edges of the stencil on to the Kraft Card - remember the Colorbox white ink is very thick and opaque so you only need a little ! Lift the stencil on the unhinged side if you wish to check the depth. 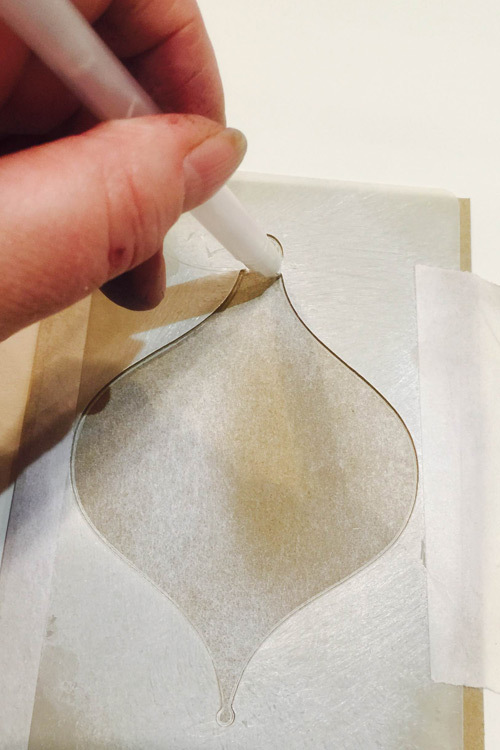 With the stencil still in place use the Sakura White Pen to draw an outline around the inner of the stencil. Hint: To quickly get the ink flowing to the nib - hold the pen with the nib at the bottom and flick the pen like a thermometer. You can lift the stencil on the unhinged side if you need to check the line to see if you have missed any. Line completed - ready for stamping. Now you can if you wish stamp the image with the Colorbox White Ink Pad (I'll show you that in the gallery this weekend) but I like to use the Memento Rich Cocoa so I can then add white highlights with the Sakura Pen. Using the Sakura white pen, colour the parts of the image where snow may naturally lay such as the fence, branches and yes the roof! 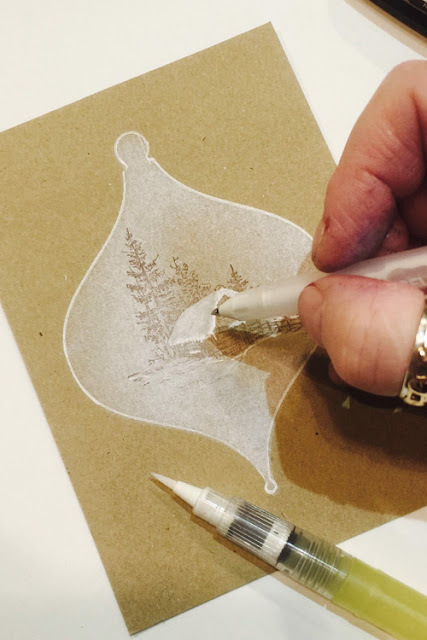 Use the white pen to scribble a heavy line of white around the lower edge of the roof, then using a waterbrush (paint brush and water if not) blend the white line out to the top of the roof, blast with a heat gun to quickly dry. Add more white around the edge of the roof for more definition. Almost Finished .... So here's mine coloured in with the Sakura White Pen. Did you remember to colour the chimney pot and add some white smoke? I've also added snowfall dots. Time for some Sparkle ! Use a quickie glue pen and glitter to add some sparkle. So this is just a very quickie walk through for you. 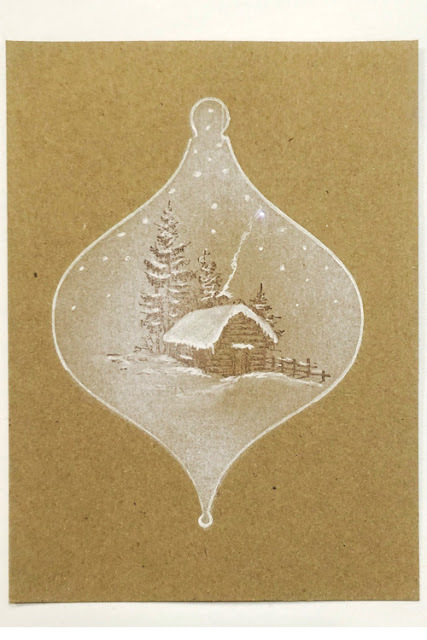 I'll get a video done this weekend and also a gallery of lots of different ones using same baubles but different stamps, same stamps but other stencil shapes and I'll also show you how to tint the white to give even more effects. That's great, Deby, thanks for posting it. 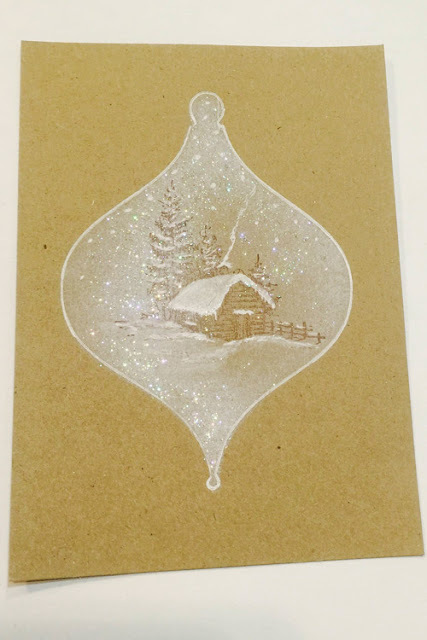 I was never really a fan of kraft card - until I saw your fabulous cards at Stamp Magic. I really like the effect. Will look forward to seeing more photos. Hope Emma is feeling better soon. An excellent design and thank you for sharing the tutorial. So glad to see the blog spot up and running. Have bought several of your stamps etc and look forward to seeing more ways to use them on here. 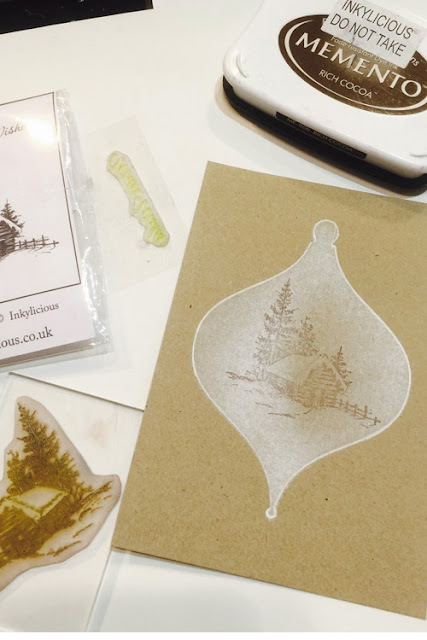 This 'bauble stencil' tutorial is brilliant, thanks for sharing it, can't wait to see the video. Love this tutorial,watched the tutorial at the NEC and thought it was great then. I'm loving the Blog. I have been checking your web page to check if you started a Blog so now I'm so pleased and looking forward to your demos and banter. Great card Deby, very excited about your Blog, love your stamps. A great technique and tutorial, thanks for posting it on here. I bought the stamps at the NEC but could not get near enough to the table to see you demo this. Hi Deby, nice to see you back in Blogland! These cards are stunning and the tutorial is great. I'm sorry I missed you demoing the technique at Donny....you were taking a well earned rest from the demo table when I dropped by. I hope Emma is on the mend! I'm a bit late but thanks so much for this, it's so interesting to see how you did it. The card and the effects are lovely. Beautiful is there a video yet? This is a beautiful technique. Thanks for sharing the tutorial.